Finance Costs > How Much Does H&R Block Cost? 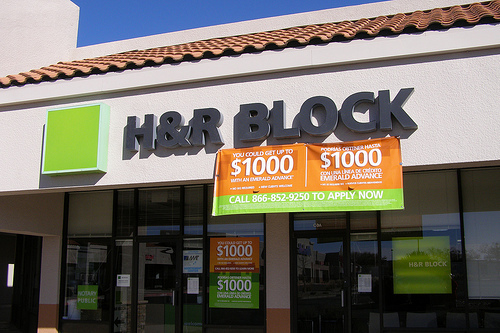 Known for having 12,000+ tax offices within driving distance of most Americans, H&R Block offers both in person and online tax filing options. How much does H&R Block tax preparation cost? The cost of H&R Block tax preparation greatly depends on your financial situation, your geographical location and if you’re using the software or a tax professional at a local office. According to the firms’ annual reports, the average fee is $147 per return, which is often a 1040 with a state return and no itemized deductions. However, if you were to add itemized deductions and a Schedule C with business income, then this fee could easily double or even triple. Plan on spending a certain amount per form. NOTE: With most of these prices submitted, most were for a simple 1099 and a few forms/deductions. Your results will greatly vary, so it’s best to use these numbers as an estimate. As for the online option, H&R Block offers three options: the Free Edition, Deluxe and Premium package. The Free edition, which is best for new filers and simple returns, will be free for federal and $29.99 per state filed, while the Deluxe version, best for homeowners and deductions, will cost $54.99 plus $39.99 per state filed. Lastly, the Premium version, ideal for investors and small business owners, will pay $79.99 plus a $39.99 per state filing fee. Software downloadable products are offered as four versions: Basic ($29.95), Deluxe ($54.95), Premium ($74.95) and Premium and Business ($89.95). Like the online options, each product offers various features and benefits. According to someone who did work at H&R Block, he mentioned the costs would depend on the forms being used, the complexity and the amount you owe. He did mention that H&R Block tends to be pricier than a local CPA and you’re better off either doing it on your own or looking elsewhere. On this Reddit.com thread, he was quoted $300 to file his 1099-misc form, not including the rest of his filings. If you want your refund on the spot, they do allow it for an additional fee. According to sources, it is 15 percent on the first $300 and 5 percent on the rest. All H&R Block online tax products will include easy import features, Earned Income Tax Credit, 1095-A healthcare info, 1099-INT, 1099-R, 1099-DIV, technical support by chat, Refund Reveal™, free federal e-file and data security. All software packages include the same as the online products but will also include free in-person audit support. H&R Block will find every deduction available so you get the maximum refund. In a crowded market, consider other options such as TurboTax, TaxSlayer, Jackson Hewitt or even TaxAct. All software packages offer its own features and pricing tiers. FitSmallBusiness.com did a comparison of these products, showing us what it’s best for, the prices and what the free version supports. If you made less than $60,000 for the year, then you can file you can file for free at MyFreeTaxes.com. Biggest rip off in the country. I’ll go elsewhere next year!